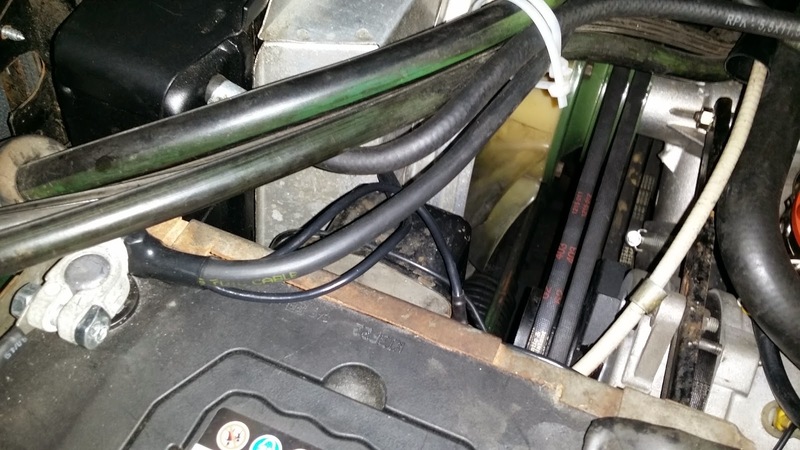 On some cars tackling a leaky heater matrix means many hours spent removing the dashboard, moving wiring looms out of the way and various other components before you get to the matrix. On a DS the job is around 10 minutes, when you know what you're doing of course and thanks to Colin Smith of http://citroendsrestoration.blogspot.co.uk/ I was able to tackle the job with confidence. 2. 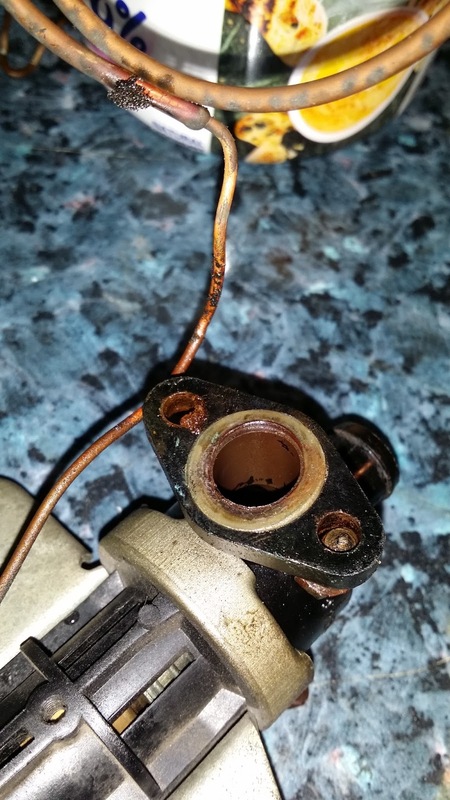 Release the cable from the heater valve by undoing the clamp and the bolt on the valve. 3. All you now need to do to release the matrix from the heater box is to un-clip a spring clip which goes across the matrix. 4. You can then lift the matrix out, beware though, it will get stuck at the rear of the matrix since there is a copper coil that you need to ensure the top end of it is clear of the heater housing. I used a thin metal ruler which helped me push it back as I lifted. 5. 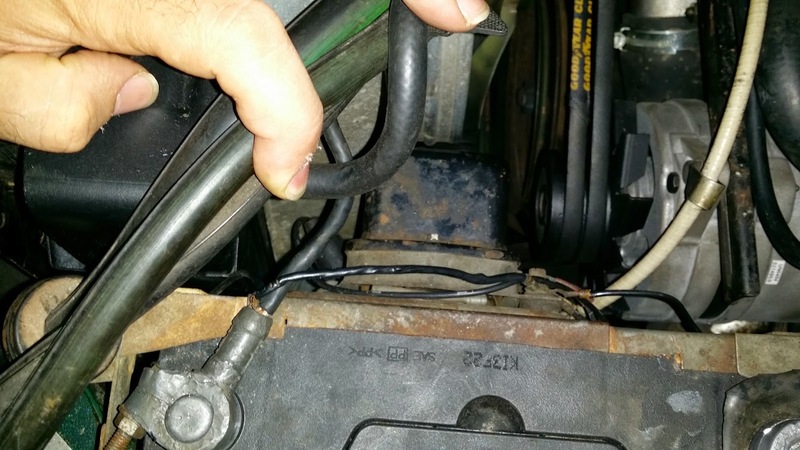 Now that the matrix is on the bench, you will see a V shaped clip that is holding the heater valve coil element, carefully remove this to release the element. 6. 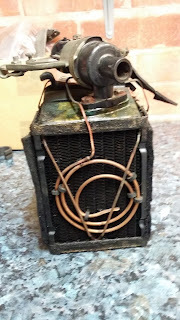 Next, spray penetrating oil on the bolts holding the heater valve to the matrix, wait a few minutes and then tighten slightly to break any rust present. Then add more penetrating oil and unscrew slightly, add more penetrating oil, wait, and then unscrew again slowly until it comes off. 7. You will notice that there is a rubber o-ring that seals the heater valve with the matrix, replace. With the matrix off it's a good idea now to flush it with water from the hose pipe until the water that runs through it is clean. Luckily mine was pretty clear which I gather is unusual, if yours isn't you may want to try a caustic solution or have it cleaned professionally. With a new rubber O-ring sourced it was time to put it all together but importantly to replace a 10mm wide felt strip that surrounds the top and bottom of the matrix which over the years is usually very perished. The purpose of the felt is to provide a seal and thus contain the heat from the matrix within the plastic heater box and not allow it to escape which has the disadvantage of warming up the engine bay and not providing the full heat in the cabin for heating. I found that closed cell foam worked a treat here and even more conveniently I was able to purchase it in exactly the correct dimensions I required: 10mm width at 3mm thickness and 3metres length (more then enough) for £3.30 inclusive of delivery, the added bonus is it came with very sticky adhesive on one side. In hindsight 5-6mm thickness would be better but I was able to just double it up without issue. I was debating whether to change the old filament bulbs in my dash gauges for modern LED equivalents. 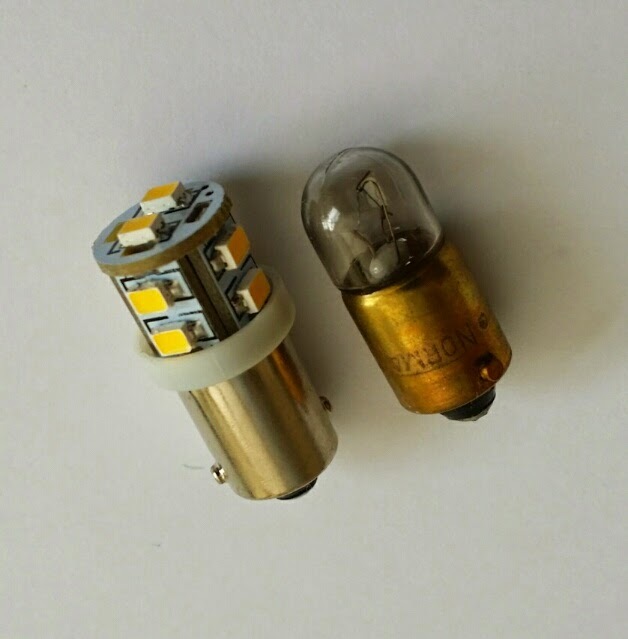 LED bulbs produce less heat and are much brighter than their filament cousins. They also can be fitted with no modification required to your vehicle - providing you obtain the correct ones of course. I decided to perform this upgrade when I found it increasingly difficult to tell if my main beams were on or off. The reason for this is due to the blue filter, which with age loses its translucency. 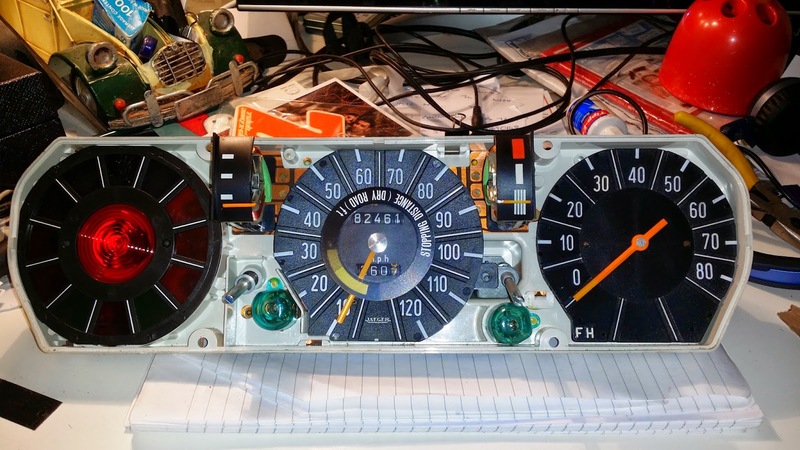 In addition I found that the speedometer and tachometer were also quite faint at night, so these two were to be replaced also. These are not bayonet fittings but a flat blade type fitment. Two bulbs are required and these bulbs also illuminate the petrol gauge and the water temperature gauge, if fitted. It wasn't difficult at all to order the correct bulbs I required first time. This was due to Gil Keane who runs a company called 4Sight automotive. Gil has been involved with classic cars for many years and was very helpful and knowledgeable following a call which resulted in an order. He also offers a complete money back guarantee if you're not happy with the result. My requirement was that I didn’t want the light to be too harsh and I think the result is quite good. Gil also advised that a blue light for the main beam would make it less harsh. The result, I can finally see my gauges properly! One thing to note with LEDs, is that the dimmer knob becomes redundant since LEDs run at a constant brightness, turning the dimmer knob down will result in the LEDs not lighting up at all. Edit...I have since been informed that Gil can provide a rheostat that can be used in conjunction with LEDs. Not all D's were created equal and as such not all had a water temperature gauge, my 1971 DS Pallas certainly didn't have one and like many which have the later style dashboard you'll find that if you don't have a temperature gauge there will still be a space for one in your instrument panel, opposite where your petrol gauge is located. Since I like to keep an eye on data relating to the engine's condition I definitely wanted to install the gauge and especially since fitting one wouldn't alter much of the originality of the vehicle. 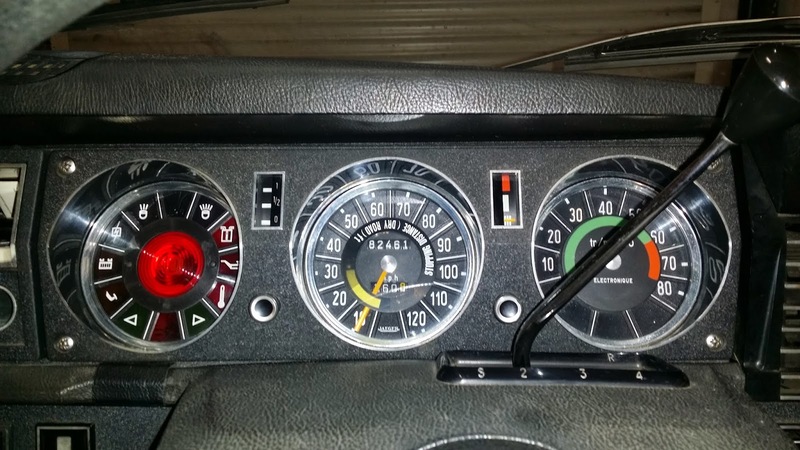 Once the gauge and temperature sender was sourced, thanks to Citroen Classics, I set forth to fit it and was pleasantly surprised how easy and rewarding it was. What's more the factory service manual takes you though each step, see FSM 814 Volume 2, "Fitting water temperature gauge". Step 1 - Disconnect battery. Step 4 - I had to remove the steering column trim since I couldn't manage to lever the instrument panel out, but this is easy as it's secured by two bolts underneath. Step 6 - Unscrew the speedo cable from the speedometer and unplug the 3 plug connectors (they are colour coordinated and only go in one way so no chance of getting them mixed up). Step 1 - Pull off the two knobs on the front of the instrument panel, you will find that it's impossible to do so by hand. I did it by wrapping some material around it and then gripping gently the shaft of the plastic knob with a long nose plier. The next step is to use a wooden spoon (wooden spatula would work also) between the pliers and the instrument panel to lever against the plier and the panel. This technique worked well and it doesn't mark the trim in any way. Step 3 - You now can remove the front of the panel and clean the plastic lenses easily on both sides, it also reveals the blanking plate which covers the space where your gauge will be fitted. Step 4 - remove this blanking plate, you'll find that if you push from the top it easily pops out. Step 6 - the gauge can only go in one way, and once position screw the 3 philips bolts in place and your done. 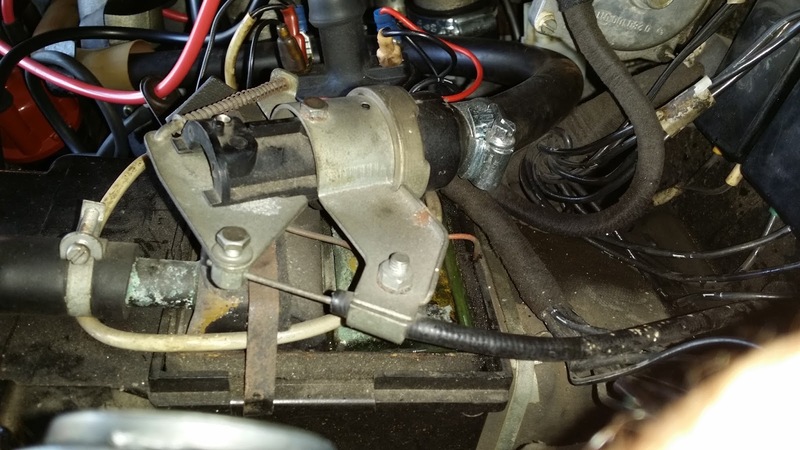 The next step is to fit the water temperature sender, which on my car is located on the "water pump mounting housing" (not the water pump). A blanking plug needs to be removed which allows you to insert the sender. 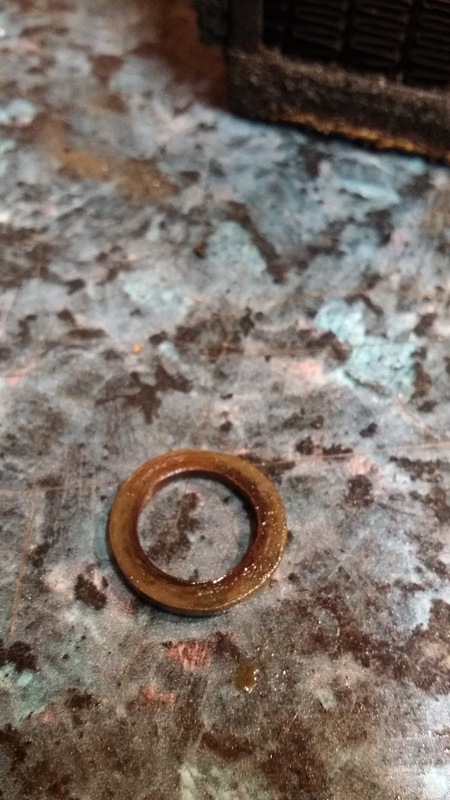 I've not done this yet as one school of thought says that the complete water pump needs to be removed as if you try to remove the plug it can strip itself and ruin the threads, jury is till out on what i will do and after asking a few people I'll make a decision on how to proceed. 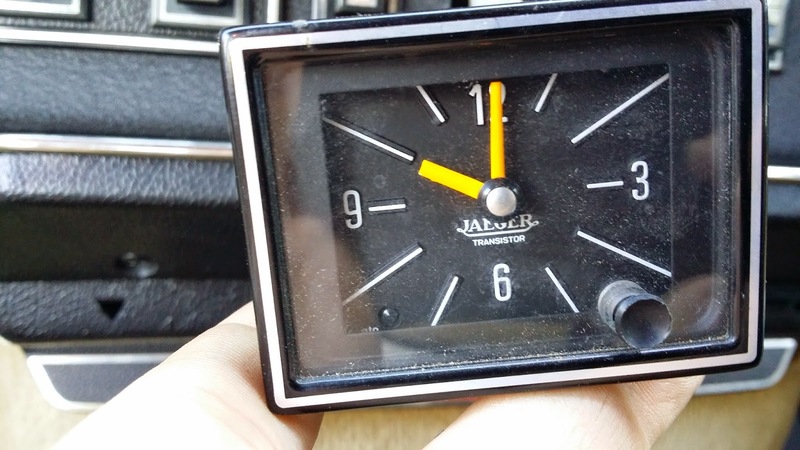 My Jaegar clock wasn't working so I removed it from the dash, put 12 volts through it and tapped it a couple of times in the hope it would come alive, unfortunately it didn't. My next step was to take a look inside and see if anything obvious looked out of place or broken. To get to the clock mechanism you must firstly remove the time set knob from the clock, on this style of clock it pulls off on other style of D clocks I am told it may unscrew. It was hard to pull the knob off and I found that a cord wrapped around the base of the shaft made the job a lot easier and one tug of the cord and it was off. The next step is to carefully prise away the bezel, you need to exercise care as the trick is to do it uniformly and try not to deform the metal too much. I found that pushing the edge of the bezel against the edge of a table whilst I prised away with a knife worked for me. Once the bezel is off the glass can be removed. The next step is to then undo two bolts from the rear of the clock. 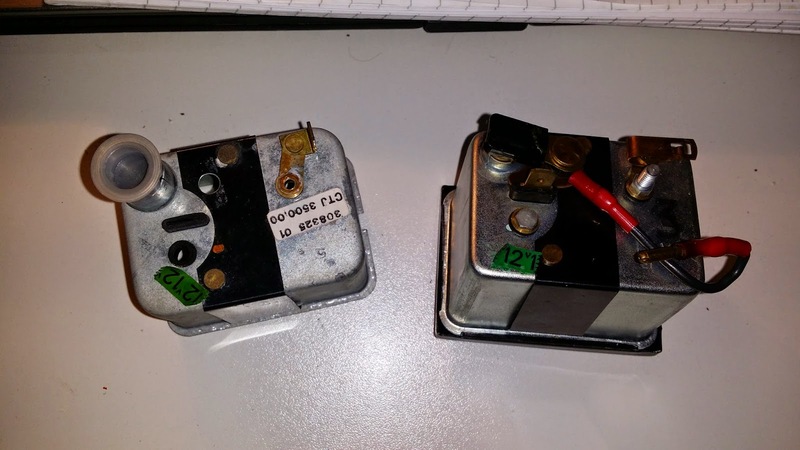 From memory they are both 7mm, and once you unscrew them the mechanism slides out. 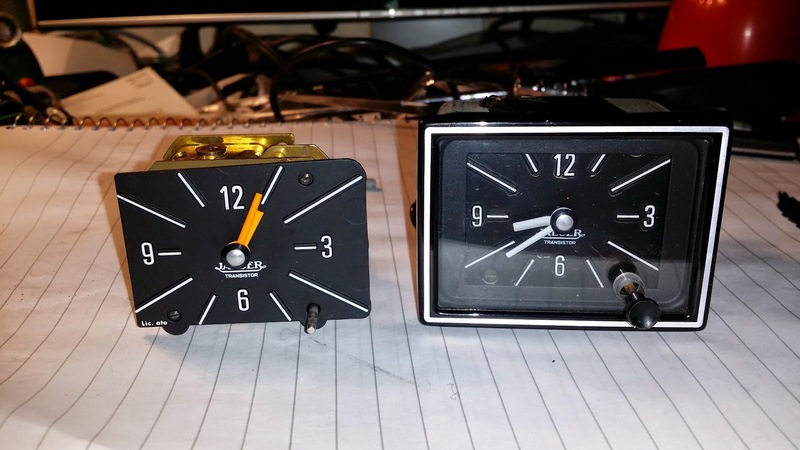 Mike Phelan has created a write up on how to repair the clock, and can be accessed by clicking here. 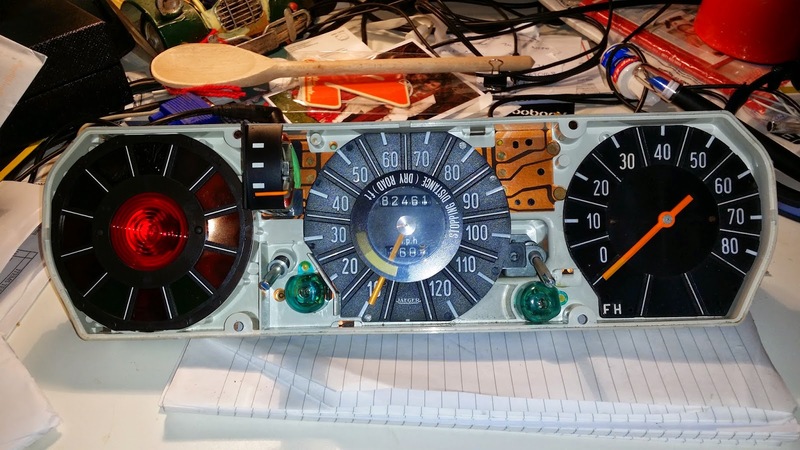 I decided though to not try to repair it since I was lucky to find a new old stock Jaegar clock for a Humber Sceptre/Hillman Hunter from 1972, which looked very similar to our Citroen clocks. I thought as the seller didn't want too much for it, I'd give it a try. The only noticeable difference I can see from the seller's photos was that the rear casing was slightly different due to the way the Humber Sceptre light illumination was set up. My hunch was that I could swap my Citroen outer casings including bezel with the new clock internals. I am pleased to say that's exactly what I did and I know have a new old stock clock. The only difference now is that mine has white hands instead of yellow, I understand from Mike's write up that you can swap the hands but after applying some pressure and no movement I thought I'd quit while I was ahead and not damage anything! Since Jaegar produced a number of this style of clock for different manufacturers it may be worth considering this modification if you can't find a replacement or repair yours. In October last year I had a visit from Mr. Nigel Wild, he was in the area and had kindly said he'd come and see Celia to help with uncovering the mystery of the colour. To recap, the paint code in the engine bay reads AC318 which is a sandy gold colour, see here , yet Celia is painted a non Citroen colour - it's a chocolate brown as found on MGs and Triumphs of the period which was called "Russet Brown". Prior to Nigel's proper inspection there was no hard evidence of any previous colour on the car and we therefore didn't know whether the car was painted that way from new or had a complete colour change. Initial thoughts prior to looking at the car was that that the paint tag in the engine bay may have been incorrect. Nigel was going to help me determine this and solve the mystery. Nigel was able to quickly establish what had occurred, at some time in the car's life the body work was starting to get tired. The owner decided to fit brand new panels, so new doors, boot, bonnet were ordered and painted in his new brown colour choice. Nigel noticed that these panels still had transitory primer on them and the rear wings which had not been replaced were sand metallic under the brown paint. Nigel also lifted some trim from the indicator trumpets and again you can see that the roof was also sand metallic. I will be respraying the car back to it's original sable metallise when the time comes. Well it's been ages since I've posted... and the more I've left it the longer it's taken me to get back to it but here I am with some updates. I got the car back from Darrin with a few home truths that I didn't really want to hear but had to.. the chassis wasn't as solid as I had hoped...! Besides the items I was aware of Darrin informed me that one of the sills needed work and he also recommended the other get's done too as they usually both go, so time to sell my Datsun 240Z to fund the restoration. This brings home the importance of taking off the outer decorative sills as found on the Pallas models to really see how things are, disappointing yes, but I don't regret it as I would have still bought her regardless. Now as far as enjoying the car in the Summer, Celia had other plans. I had one local run with the family but teething problems here and there; starter motor failed and a leaking injector, put an end to any further fun in the sun. These inconveniences were rectified but another malady occurred this time a lean misfire which got progressively worse to the point of making the car un-driveable. Old cars which have not run in years often take time to settle down, this "shake down" period is often the time that the car reveals any inherent problems. After a variety of testing, swapping coils, spark plugs, distributors etc.. the problem still persisted. 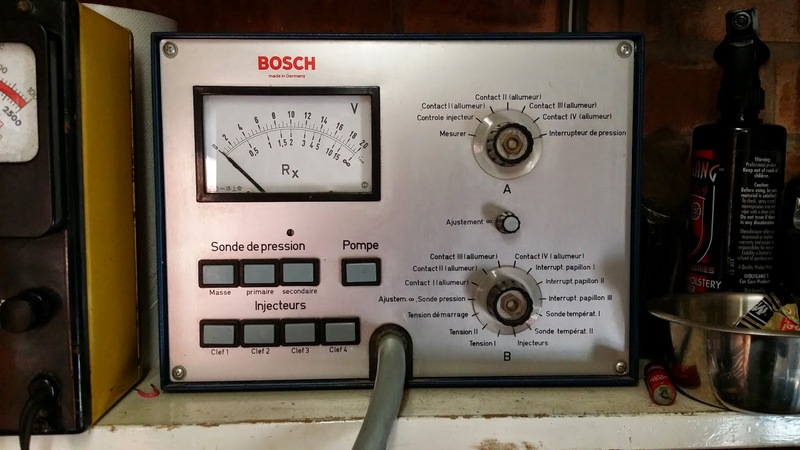 Not wishing to be beaten, I even purchased a Bosch D Jetronic tester to get to the bottom of it as I suspected it was the early D Jetronic fuel injection system at fault. Whilst I didn't carry all the test out as laid out in the FSM it passed the ones I did try. One of the points the FSM states prior to commencing the tests on the fuel injection system is to ensure that the main earthing points are in good shape, mine being original and a little frayed it was important to change. So I replaced the earthing strap which goes from the battery to the water pump which also includes the earth for the fuel injector loom and since the original strap is fairly thin I decided to replace it with a thicker cable for good measure. Despite my best efforts the misfire persisted and Darrin was able to take a look and get to the bottom of it. The issue was a powdery residue was blocking the fuel injectors. Being the inexperienced mechanic that I am (read not a mechanic) I ruled dirty injectors out, since they were new, fuel filter was new, fuel tank was new and so too were the rubber fuel lines. The cause; a dirty fuel rail. Now this has been fixed she is running well and some tweaking of the clutch release mechanism has made her a joy to drive, if you've not tried the BVH please try to, it is worth experiencing being a joy to use when it's set up right. One thing I did notice that I will need to keep an eye on is a hesitation; when sitting at 70mph on the motorway in 4th gear the revs dropped from around 3,000rpm to 2000rpm and then recovered, this blip has happened more then a few occasions now and I am hoping it will go away but I suspect not... will update once I've discovered any more. If you've got any ideas what could be causing this please let me know. I received an email from Darrin Brownhill of Citroen Classics on Friday afternoon which was very well received. I had asked Darrin if it were possible to take a video of Celia starting once he was at that stage during the recommissioning and what I received made my day! What's more she started first time, a great feat if you consider she hasn't moved in 21 years! Thank you Darrin for all your hard work. So far so good, with no stuck clutch or seized brakes and she sounded pretty smooth too! All images and text ©MyPallas.net and may not be reused without permission . Simple theme. Powered by Blogger.